The Cajun Relief Foundation finally has stopped long enough to setup our own online store! We’ll be adding a mix of the various Cajun Relief shirts that you’re starting to see worn everywhere soon. 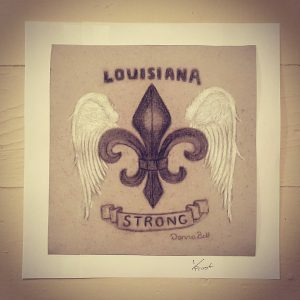 However, we’re really excited that the first item is a $35 Louisiana Strong limited edition print by our good friend Donna Bell . Donna Bell is a quadriplegic, meaning she is completely paralyzed and has been confined to a wheelchair since 1979 when at age 15 her neck was broken in a car accident. Unable to move anything below her neck, Donna draws with her mouth! These prints were created after the flood as a tribute to the Cajun Navy who rescued her. They are really special and even better she did this to help herself!! Let’s do the right thing and help her. By purchasing a limited edition (only 500 will ever be printed) signed and numbered Louisiana Strong print you’re helping Donna purchase a new wheelchair. Donna was so moved by the Cajun Navy who rescued her and her mother from flood waters that she designed this print to honor them. Along with the print, you’ll receive a card on the back that tells Donna’s story. I personally was privileged to spend 3 hours with Donna and her mother when discussing this project. After leaving, I felt like I had been touched by an angel. You see, Donna’s entire day for the last 37 years has been spent sitting unable to move anything except of for her head. Donna was paralyzed in 1979 at age 15, after being in a car accident. As I sat there and watched her in her wheelchair I noticed her arms seemed too dangle uncomfortably by her side. That’s when I realized she couldn’t put her arms on the arm rests that were just below them. I asked about it and she explained that the wheelchair which has been graciously donated to her was actually not the right size. She has used a custom fitted wheelchair for most of her life but the one she had used for years was lost in the flood. And with their home repairs reaching into 6 figures, they simply could not afford one for her at this time. To the untrained eye, it might seem like a wheelchair is a wheelchair.. but when you spend every minute of every day sitting in one… certain custom things are just needed. The chair she currently has is also not a power one and Donna relies on her older mother Teresa to move her around. So you see, your $35 purchase after expenses, will go directly to help Donna Bell to replace the custom wheelchair that she lost and that she depends on for daily comfort. Purchase your Louisiana Strong Limited Edition Print Here.